July 18, 2018 - But not for me. My father and I have done this race for the last dozen years when I haven't been at Musselman. He's been there every year. We both aged up this year, me to 50-54, him to 80-84. My brother was in town too from Seattle. It was an emotional race for us having lost our mother last November. We used to call her the team manager. 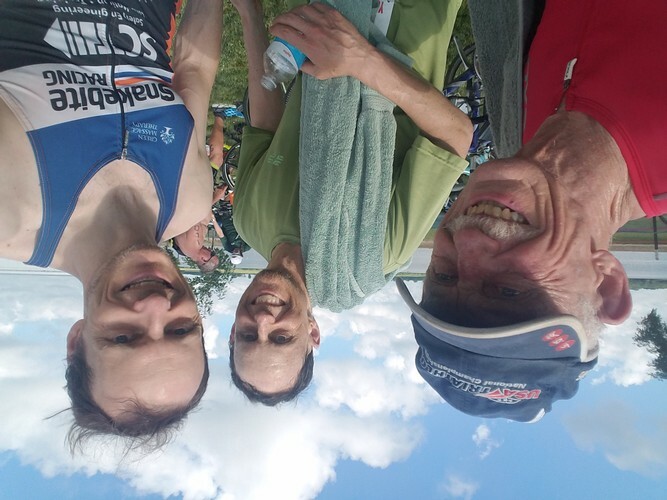 Anyway, we three ran the race together and, even though I suspect I could have podiumed, I was happy to cross the finish line with my family and help my father win the title. He's now qualified for the National Senior Games. Fun fact: in his senior yearbook he was named most likely to win the Olympic mile and then be disqualified for riding a bicycle. I'm not sure what that means, exactly, but I don't think he was the best athlete. He's so proud of what he's doing now, and it makes me really happy to be a part of it.